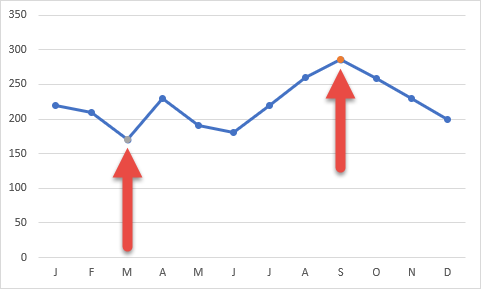 Is it possible to call attention to the highest and lowest values in a line chart dynamically? Can we color or accent these values in the line chart when our data changes? Can we have the colors or accents change dynamically when the data changes? You bet we can… but not natively. 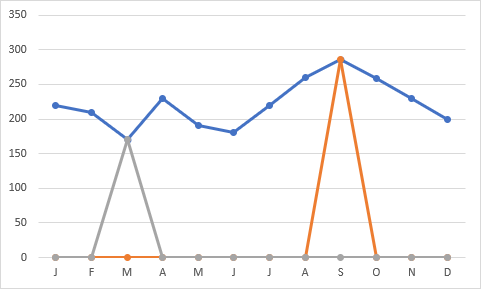 We will have to employ a bit of Excel chart trickery to achieve the desired result. The good news is that this is a very simple trick to learn and use. 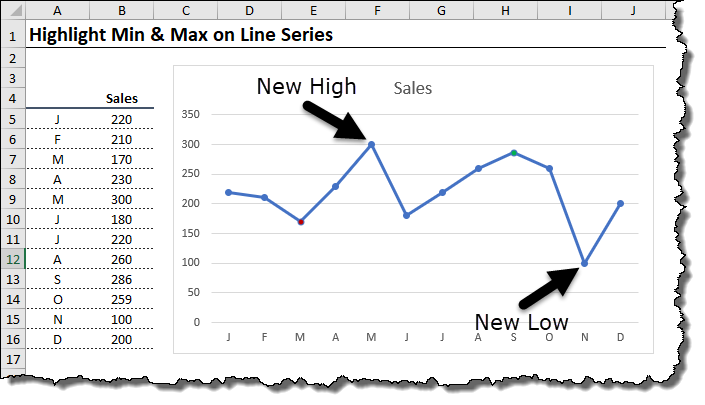 We will begin by creating a standard line chart in Excel using the below data set. 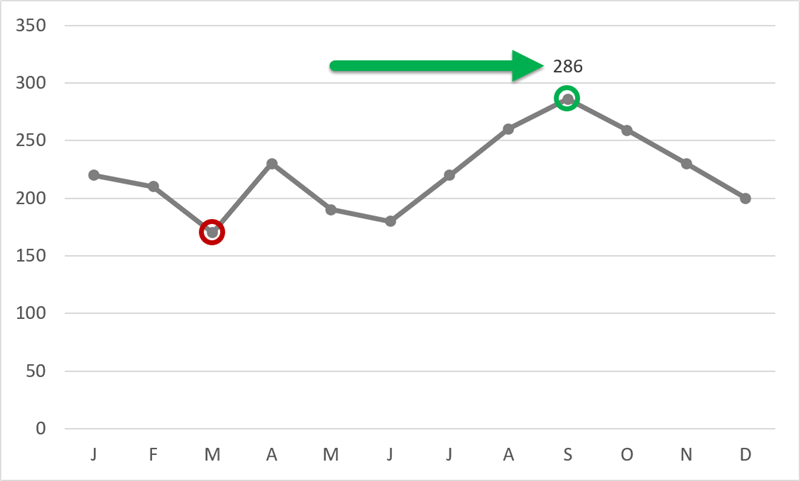 Click anywhere in the data and select Insert (tab) -> Charts (group) -> Insert Line or Area Chart (button) -> Line with Markers (top row, second from right). 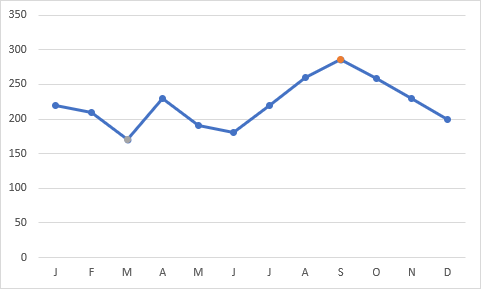 Although this works, the drawback to the manual method is that if the data source changes and a new data point value is entered that is larger than our previous largest value, the chart will not automatically update. It would be our responsibility to reset the color on the “old” largest value and recolor the “new” largest value’s data point. 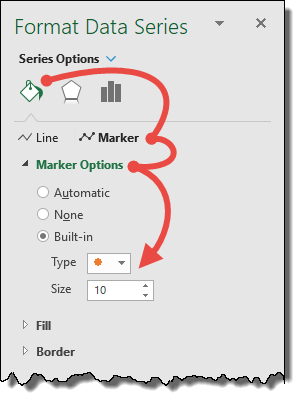 We want the chart to automatically color the marker with the largest value green and the marker with smallest value red. 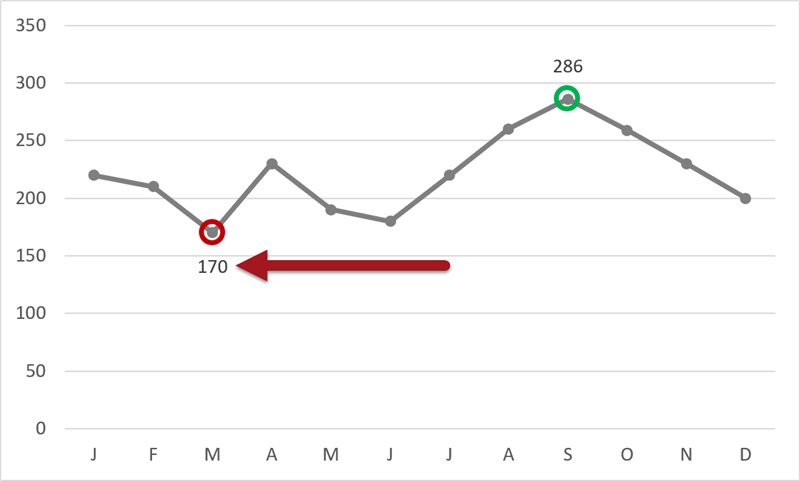 Unfortunately, the built-in Conditional Formatting tool in Excel cannot apply this desired look to our chart. 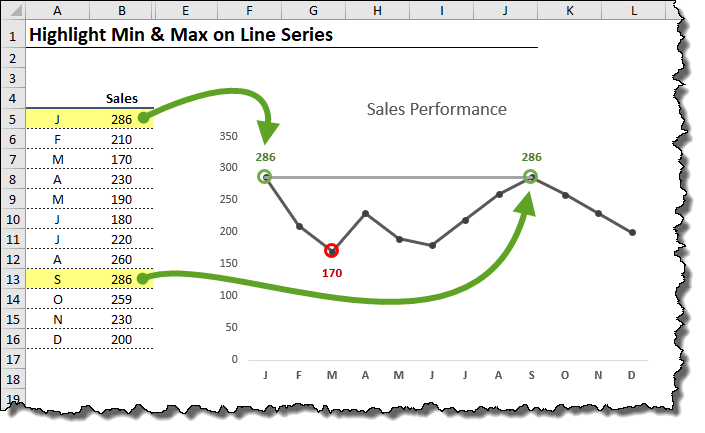 When you wish to dynamically alter the look of a data point in a series, you need to create a new series in the chart. This “helper series” will be used to create imagery that will be placed in front of the appropriate data point. This will serve as a mask and hide the original data point appearance in favor of a new appearance. Since we will create two different color accents, we need two additional series in our data. 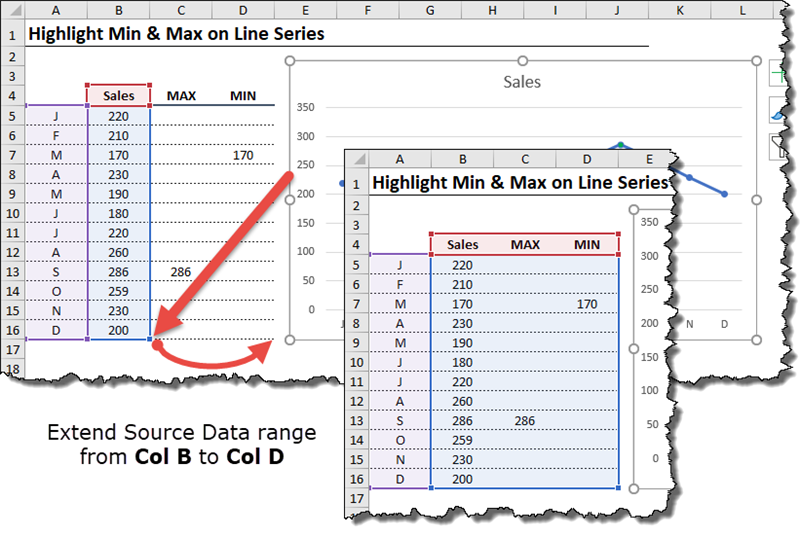 Create two new series headings in the chart data labeled MAX and MIN. In the MAX column, we want to repeat the value on the month that has the largest value in the set, but we do not wish to have anything show for all the other months. 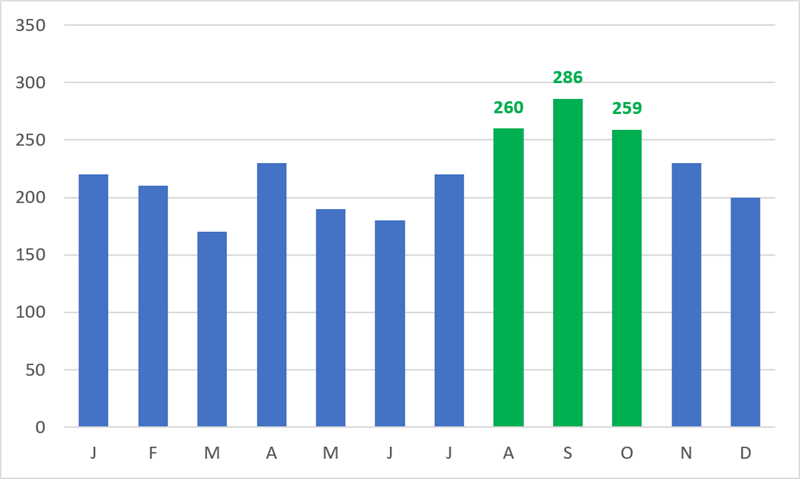 In the MIN column, we want to repeat the value on the month that has the smallest value in the set, but we do not wish to have anything show for all the other months. We will accomplish this with an IF logical test. Fill the formula down for the remaining months of February through December. Observe the results. 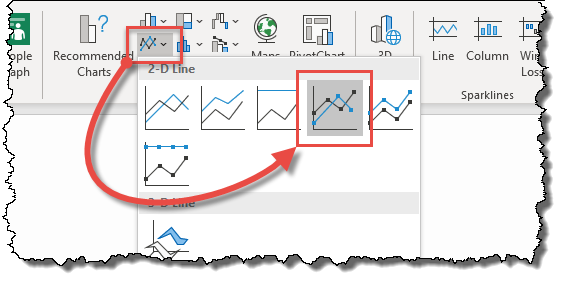 Select the lower-right handle of the blue border surrounding the chart’s data and drag the handle from column B to column D.
If you wish to incorporate new data into an existing chart, the following method works as well. A very odd thing will occur in the chart. 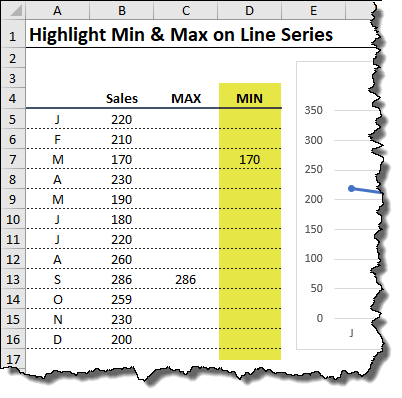 Notice that wherever we have a blank cell in the MAX/MIN columns, we are plotting a 0 (zero) on the line chart. This is because Excel interprets an empty cell as zero. Our goal is to only plot the two data points where a value other than zero occurs. To prevent our line from “crashing” to the bottom of the plot area whenever a zero is encountered, we will employ the assistance of the NA() function. Fill the formulas down for the remaining months of February through December. Observe the results. We are replacing the zeros with a user generated error of #N/A. 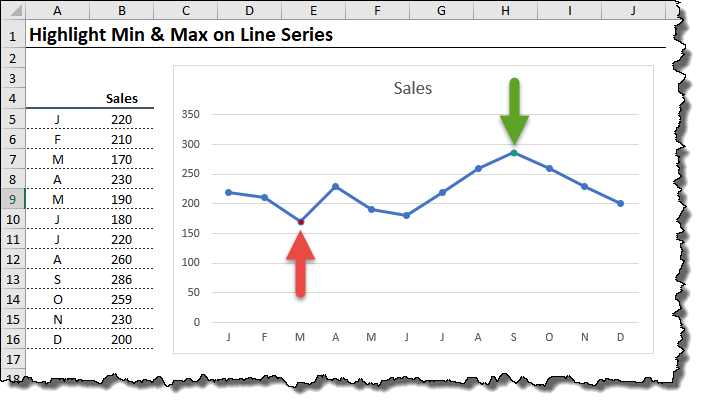 Excel will not plot these errors on the line chart which yields the desired result. All the “crashed” points have disappeared leaving us with only two additional data points. 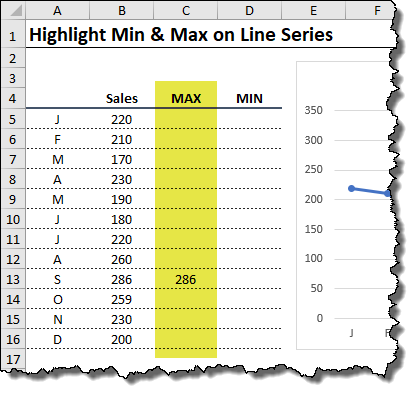 Click on the orange data point that represents the largest value in the set. IMPORTANT: Make sure you only click ONCE on the data point; not twice. 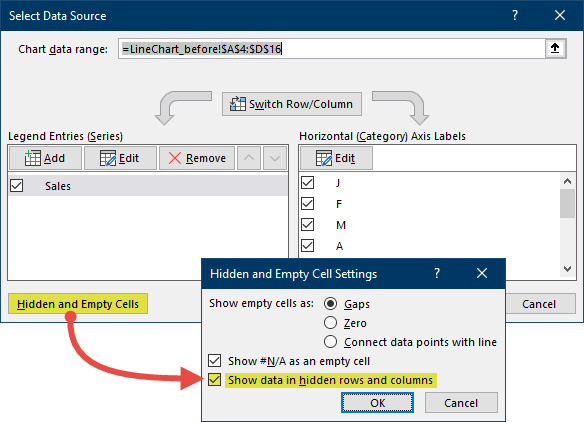 Clicking once selects ALL data points in the series. Clicking twice selects only a single data point which defeats our purpose. Press CTRL-1 to open the Format Data Series panel on the right. 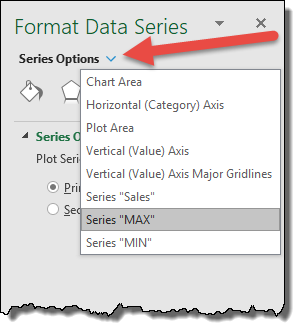 If you are uncertain if you have the correct series selected, use the Series Options dropdown list at the top of the Format Data Series panel to select the proper data series. 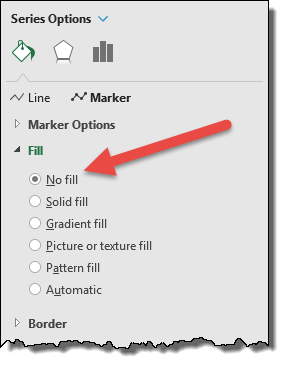 Select the Fill and Line button (paint bucket), select the Marker sub-category and expand the Marker Options section. Select the Built-In marker type of a circle and set the Size to 10. 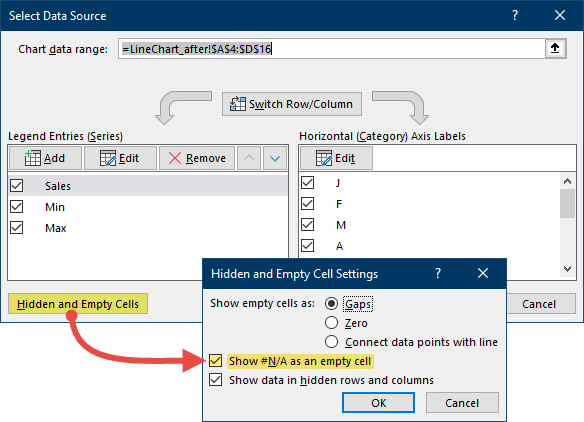 Expand the Fill section and set the fill to No Fill. 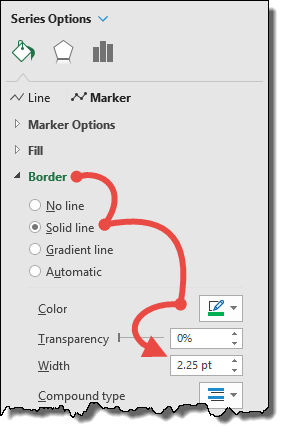 Expand the Border section and set the option to Solid Line with a Color of Green and a Width of 2.25pt. Repeat the process for the MIN series using the same steps. 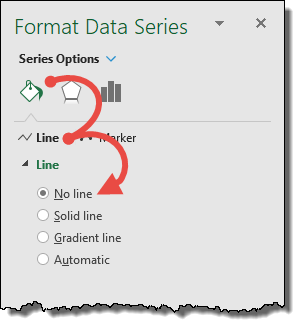 The only difference is to select the MIN series from the Series Options dropdown and set the Border color to Red. To make the chart easier to read we will add data labels to the plot points, but only to the points of the MAX and MIN values. Since this will always be highest point on the line, it makes sense to display it above the data point. Since this will always be lowest point on the line, it makes sense to display it below the data point. A nice touch would be to color the MAX/MIN data labels green and red respectively. 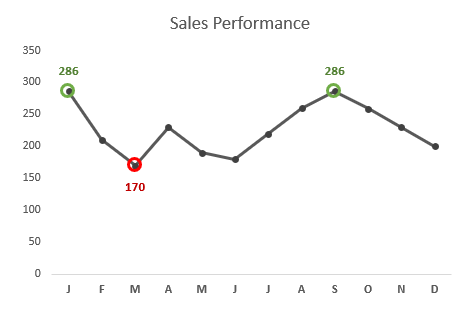 If we change the Sales value in May to 300 and November to 100, the chart appears as follows. If you don’t wish the user to see the MAX/MIN helper columns, you can either hade the columns or group the columns and then hide them. 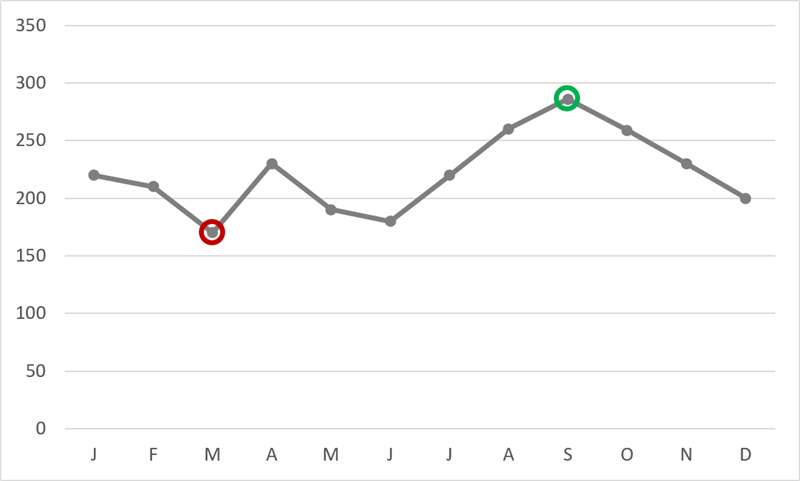 Unfortunately, this has a negative effect on our chart. By default, Excel does not chart hidden data. Luckily, we can change a setting to adjust this behavior. In the event of duplicate MAX or MIN values, a connector line will appear between the duplicate values. To suppress this line, perform one of the two actions. The result should appear as follows. …or, draw attention to the Top 3 sales in a data series. You just need to get creative with the formulas for the helper columns. 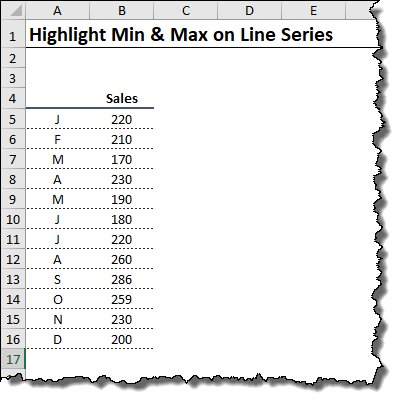 When you format the series for MIN and MAX, and the markers are just the way you want them, be sure to select No Line for the line connecting markers. 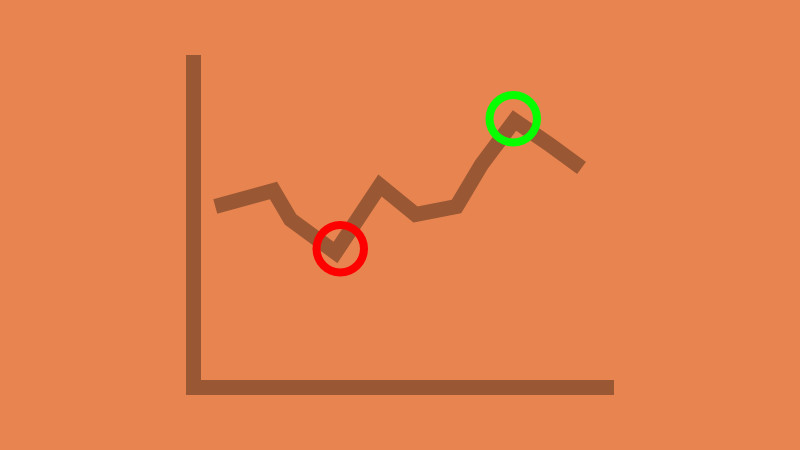 Depending on default settings, if you have two points tied for MIN or MAX, you may otherwise get a horizontal line connecting them. Thank you for that awesome tip! I have updated the post to reflect this potential issue and two ways to rectify the issue.